Please write “GEORGE CHOW” on the check memo line or in the memo or account field in your online bill payer. George and Heena Chow have served in Houston, Texas at the University of Houston since August 2016. George volunteered with IFI Columbus for ten years before joining as a full-time campus ministry worker in 2009. Heena worked at IFI, first as an intern in 2009 and later joined IFI as a graphic designer and campus ministry worker in 2011. 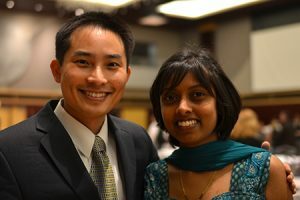 George and Heena love to serve and disciple international students in every way they can. They host weekly Bible studies in their house and spend as much time as they can with internationals. Since arriving in Houston, they have been working to establish a new IFI ministry at the University of Houston. They have been actively involved in encouraging and recruiting fellow believers from local churches to serve and disciple Internationals. They love meeting people from all over the world and they hope every International they meet will be walking with Christ, if they aren’t already! George enjoys photography, playing drums, fishing, learning new recipes, and playing board games! Heena enjoys watching movies, painting, and cooking International food!